Tri-Mountain Men's 788 Valor [788Valor] - $25.90 : Sogowear Outfitters!, Polo Shirts, Golf Shirts, Jackets, Fashion Fleece, Woven Shirts and More! Men’s 5.5 oz. 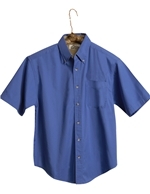 100% cotton soft twill short sleeve woven placket shirt with pocket. Designed with a contrasting color on the inner collar and inside panels. Constructed with a button-down collar and central pleated yoke back with loop.